There are so many things I really love about the little two bedroom apartment my husband and I rent. It's sunny and bright, we have a darling little backyard, our kitchen is huge, and the apartment is full of charming vintage details. But the serious lack of closet space! Sigh. That is most definitely not one of the things I love. 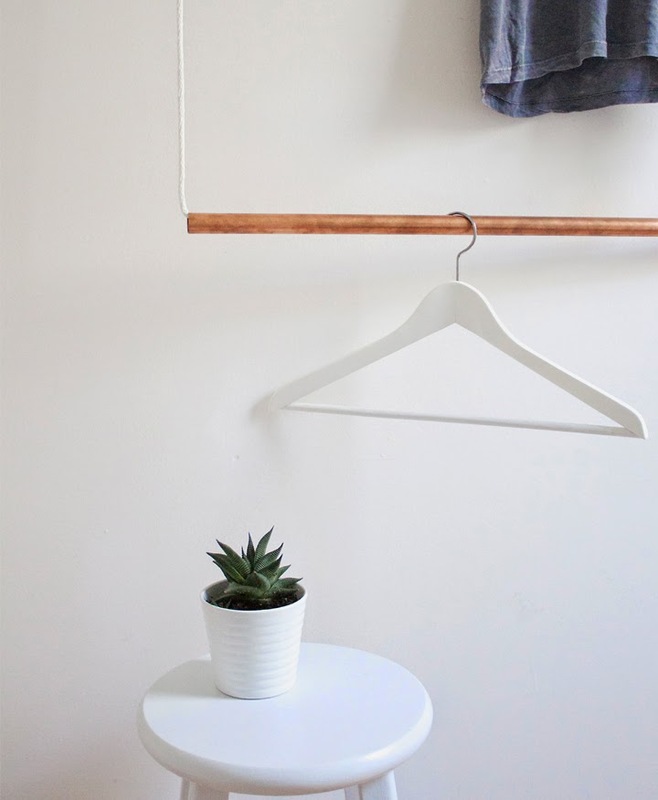 This simple hanging garment rack has been the answer to my shortage of storage prayers. And it's lovely to boot (my copper obsession continues)! Now I've thinned out the over stuffed mayhem that is my closet and put my prettiest pieces on display! Read below for the how to. ~ Two 3/4" thick copper pipes. 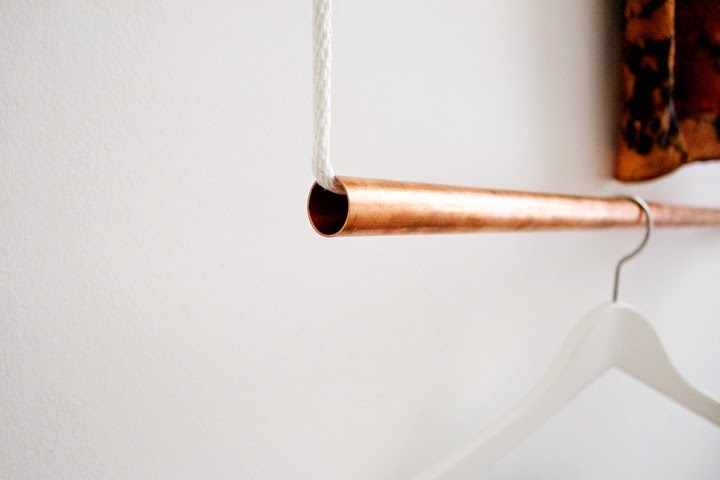 You can find copper piping at almost any hardware store and they should cut it for you right there! The length of the pipes is dependent on your needs. I went with 2 1/2' long. ~ Approximately 10' of all purpose clothesline rope. Once again, this length is dependent on your needs. Lay your two pieces of pipe on the ground horizontally one on top of the other. Pull the length of rope through the bottom pipe. Center the pipe, leaving equal amounts of rope hanging out from each side. Take the length of rope on the ride hand side and thread it through the right side of the top pipe. Repeat on the left hand side. Leave at least 2' length of rope between the bottom and top pipes. Securely knot the two lengths of rope together about 2' above the top pipe. 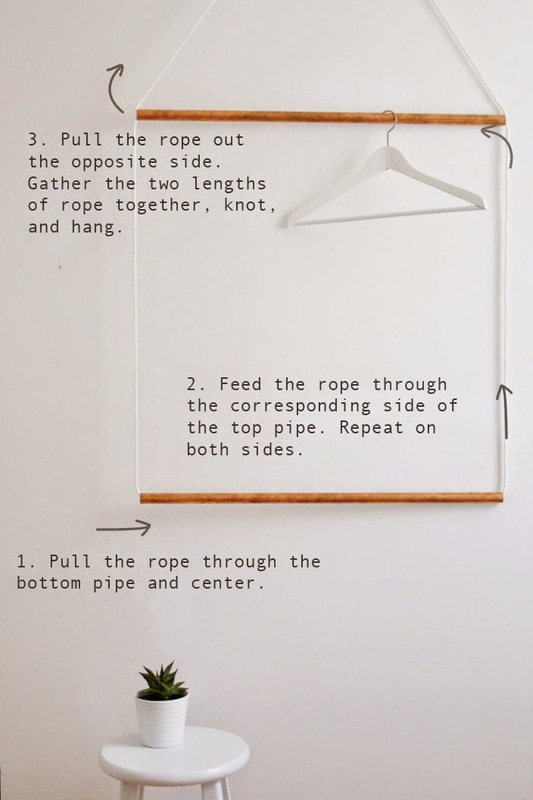 Hang from a secured hook in the ceiling or on the wall. This project took me less than half an hour to construct and cost me right around $20. This is such a great idea! I am so. so not a morning person, and I'm always stumbling around after waking up, looking for my outfit. I thought about getting a regular clothes rack to put my outfits ahead of time, but I don't like how clunky they are, or giving up the floor space. This is a perfect alternative!! I found that using an "over the door" hook that you can find at target works well too. But I love this DIY and might be running to the store now for the supplies! Ah! 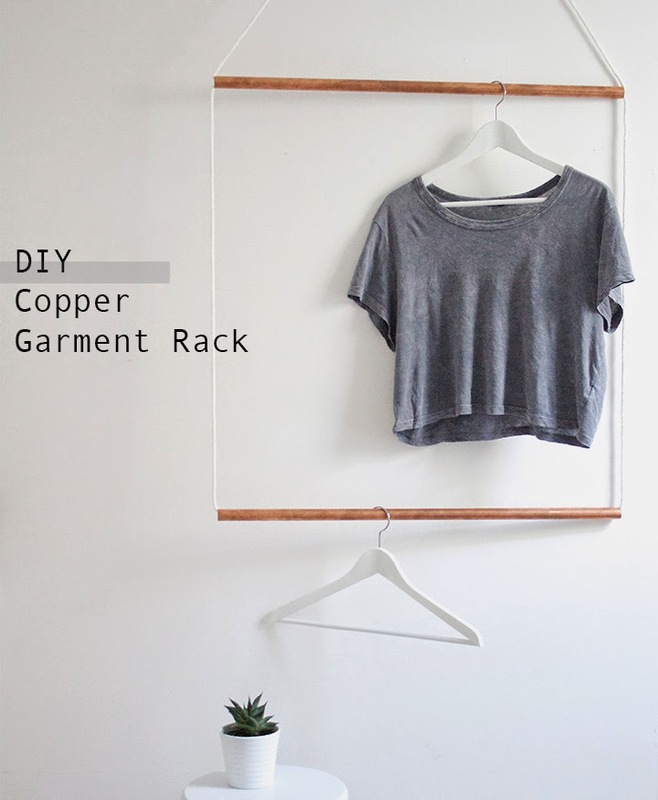 I love the cooper hanging rack, and I've wanted to do something in my apartment. 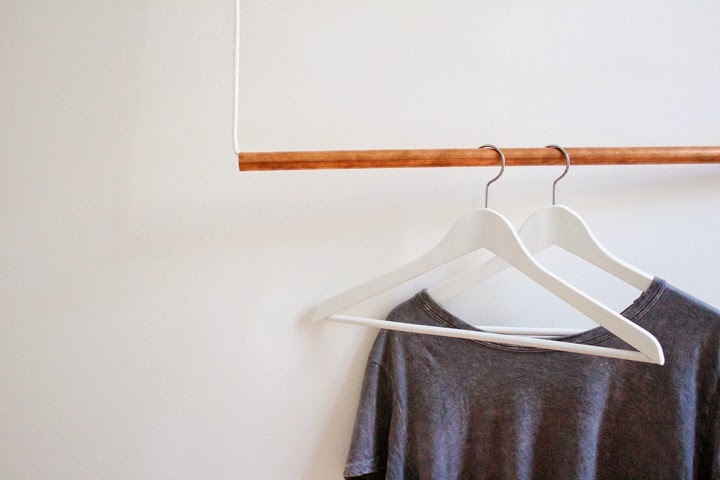 Even though I have enough closet space, I think that the rack could function as a piece of art/visual interest or it could just be a more glamorous way to separate the clothes for the next day. I am so doing this! What an awesome idea! Quick question: what did you use to hang it? Hi Tabitha! I hung mine from an anchored hook in the ceiling, although I think a hook, bracket, or large nail in the wall would work as well. As long as you're securing it in a stud so it can support the weight of the garments!